Do you meditate? I use the Headspace app on my phone and try to do 10 minutes every day. It does seem that when I meditate regularly that I am better able to handle stress. I also find that I can calm myself down in stressful situations by using some of the techniques that I’ve learned, like focusing on the breath. I also love the guy’s voice. So, does Coco. Anytime I start meditating, she appears out of nowhere. I was meditating the other day, when I heard a rustling behind me. I turned around and found her in the bookshelf behind my chair! Of course, I had to stop meditating and run and get my camera. In case you are looking at my cookbook titles and thinking there doesn’t seem to be many big names in there, this is my auxiliary bookcase. 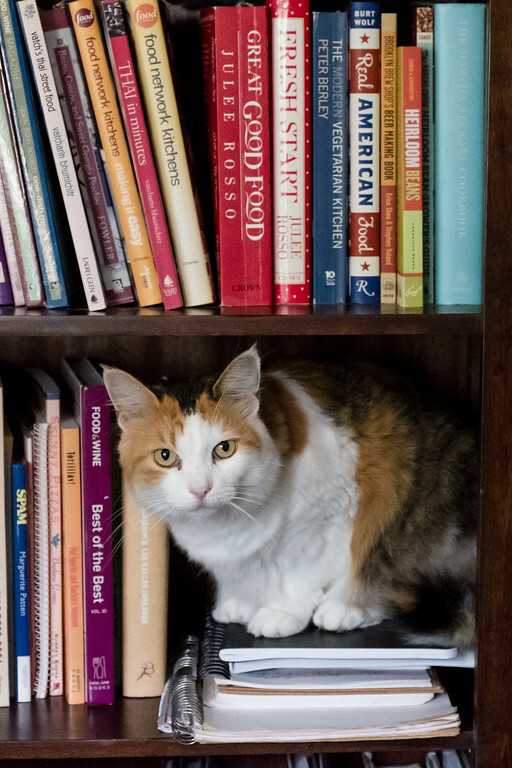 I have a main bookcase that holds the cookbooks that I cook with regularly. This olds those that I use less frequently. Yes, I have two bookcases of cookbooks. Don’t judge. Still keeping with the cooking trend here, the dining room table is where I sit to plan the grocery list and next week’s menu. I use my Macbook because I use Eat Your Books to access an index of my cookbooks. I was busy making my list, when I realized that I hadn’t seen Luxie for awhile. I closed my laptop and there she was. 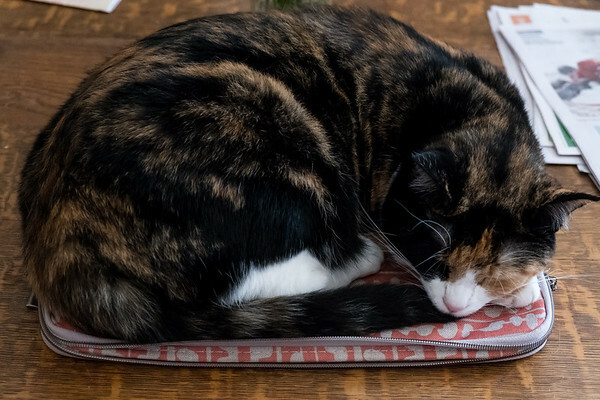 Curled up perfectly on my laptop case! It’s like it was made for her! Just the right size. For my artsy photo this week, I used Topaz Labs Plugin. Great photo, Coco! 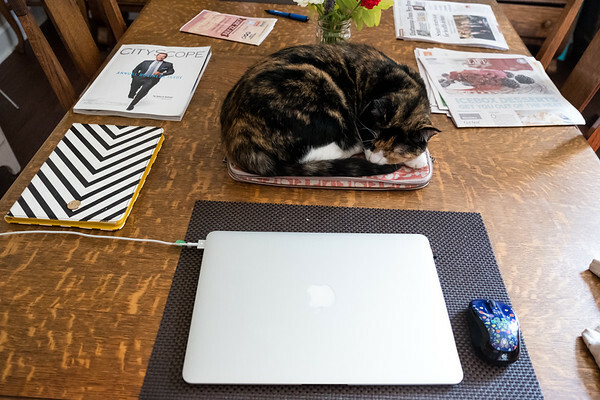 You must have known that space was purr-fect for you just as Luxie knew that case/pad is purr-fect for her. Have a good weekend! I needed this when I was working. I’m a Type A personality and internalize everything. Ah, if only I could be a cat. They seem to be so carefree! Hi Miss Pam! I think that laptop case was actually made for Coco! She looks so sweet resting on it. I think there should be a “meditation app with Coco.” I bet her just being with you helps you relax. Purrs. Mum finds it difficult to meditate but she says she will try harder. I told her the best thing to do in order to relax is to live in the moment. Just like we cats do! Aww, Luxie found the perfect spot! I love it! Aww, I love to topaz and Coco together, they are quite stunning. Now that is a cats definition of a lap top bag, a cat top bag and no mistake! Your cats are so delightful and bring you much joy. Well obviously books were made for cats to sit on. I love to read cookbooks too! I do cook from them, but also use them for inspiration. Coco knows where to be. I would say that just being with cats is meditation. Purrrrrrsss! That is a sweet picture of Coco perched on the books. Flynn liked to curl up on the laptop case too. It was on the counter top and he wasn’t allowed up there. He figured that as long as he was completely on the case and not touching the counter top surface it was okay, which of course it was. Coco is beautiful, that was a great shot. How nice that she likes to meditate with you. I have tried to meditate, but I can’t stop myself from thinking of what I need to do when I get done meditating. Coco knows were to go for a good nap. So cute.